prominent brutalist architecture, intense urban development, interesting suburbs and blossoming culinary scene. This is oh so worth the trip. Only 20 mins by the J train from Saint-Lazare lays a whole different world: you pay just 8 euros and then sunbathe on the grass or rooftop gardens and gaze at this architectural icon for, like, ever. The Le Corbusier building (1927- 31) in its white purist splendidness is an obvious cherry on the top, but its surroundings count, too: neighboring lycée, taking part of villa’s original terrain and named after the architect, is a nice example of late 1950’s modernist monumentality (1957 - 64, Eugene Chauliat), while some parts of this very old town take you to Burgundian Middle-Age village (e.g. the stunning Saint-Louis gothic church from the 14th century). I go every time when in Paris - and every time discover new facet of the complex urbanism, both in the permanent exhibition on the city’s long architectural history or in the temporary exhibitions upstairs. Free entry, beautiful late 19th century metallic structure, great source of new Paris architectural sites to see. And architectural books, like the one above. Highly popular brunch place and one of the first quality coffee spots in Paris (I discovered it some 7 years ago, when the local third wave scene was still kinda shy). Simple and delicious food (bit pricey but hey, it’s packed and in the middle of posh 7e arrondissment), all kinds of alternative coffee methods and beans from their own roastery. If full, grab a take away cup and go to the Jardin Catherine Labouré, a miraculous secluded haven with vegetable and flower patches just round the corner from all the hustle of Bon Marché mall. Another eye-candy nearby: the stroll through shops, restaurants and art-déco buildings in rue de Mezieres. Highly recommended stop on the way back from Poissy, especially if you like sharp contrasts; just take the RER A. Altough nested just below the shiny corporate towers of La Défense, Nanterre is the only town with left-wing townhall (from the 30’s!) in the wealthy western suburbs, a fact echoed also in its prominent 1970’s architecture. The Aillaud Towers (1977, Emile Aillaud) reportedly made president Giscard d’Estaing "feel like vomiting”, but despite its aesthetic controversy and impractical maintenance, the local community holds to the crazy and colourful organic forms of this fascinating residential complex. Karmic balance: the strict rectangular lines of the 113m high tower of the Prefecture area (1972, André Wogenscky). Bordering the spacious central André Malraux park, two derelict gems will make your urbex heart beat faster: brutalist building with still surviving Carrefour supermarket and metabolist Ecole d’Architecture (1972, Jacques Kalisz, Roger Salem). Graveyards are the best outdoor art exhibitions, with the extra points of usually meeting very little people. Avoid the famous tombs like Niki de Saint Phalle cat, if you want it real calm - there’s lot of other beautiful or funny (I'm dead serious) graves anyways. Tiny cheese place filled with artisan pieces of all sorts and origins that will induce tears of joy and decision paralysis to any serious dairy lover. Located on the wonderfully lively rue du Faubourg Saint-Denis - take a stroll and indulge in its charm. Another foodie pick here: popular coffee shop / florist Peonies is located just couple of doors further north. My own romantic pick in the Belleville area. (I really took one date there, I kid you not.) Kinda ethically controversial because of the ideology it serves, but I can’t resist the Oscar Niemeyer (1968) futurist design, raw concrete, dimly-lit lobby and especially the James Bond-like feeling you’ll get in the congress room under the coupole. There’s also a wonderful rooftop terrace, but you gotta be party member, bee or book a tour as it’s not generally accessible to public. Extend the flirting with Eastern dictatorship regimes by eating in one of the Chinese bistros in the area - the weirder and cheaper it seems, the more authentic / unheard of food you get. Wine bar a l’image of its (historically working class, now - obviously - hip) neighborhood. Busy, noisy, no fuss, honest, with wide and careful selection of natural wines, local beers and artisan spirits. Which would be great as it is, but CdB pushes the vice even further with nice tapas and glass of Champagne for just 8E (or good sparkling wine / cider for 5E). Big thanks to Rachel Signer, the brain behind La Pipette wine magazine, for this discovery (as well as for the bottle of tasty Yann Bertrand Beaujolais we shared there). You can also grab a take-away bottle and head to the nearby Buttes Chaumont park, renowned for its romantic hilly landscapes. 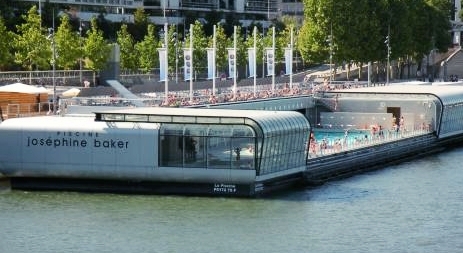 While it’s actually now possible to swim even IN the Seine itself, I’d still recommend rather to swim ON it. This floating pool on a riverbank next to Bibliotheque Mitterand is open all year round, but especially beautiful during the warm months. The glass roof opens, the huge sun deck goes alfresco and you can catch rays while architecturally indulging in the tell-tale shape of French National library (1989 - 96, Dominique Perrault) or the monumental austerity of the viaduc-like Ministere de l’Economie (1982 - 89, Paul Chemetov and others) on the opposite side.